Jonathan Demme opens his fantastically entertaining “Justin Timberlake and the Tennessee Kids” by introducing us to the backup players and musicians who have supported the pop star on this two-year tour, but make no mistake, this movie is about the entertainer at its center. While Demme’s camera never forgets to allow the other partners in pop to share time, he always comes back to Timberlake, one of the most purely enjoyable musicians around which one could center a concert film. His energy is infectious and his joy about what he’s been blessed to do for a living is contagious. So, while he says to his dancers “Look to your left, look to your right—that’s who this show is for,” it’s really a film that elevates his status, placing him next to other legends that the masterful director has filmed in concert movies, like David Byrne and Neil Young. 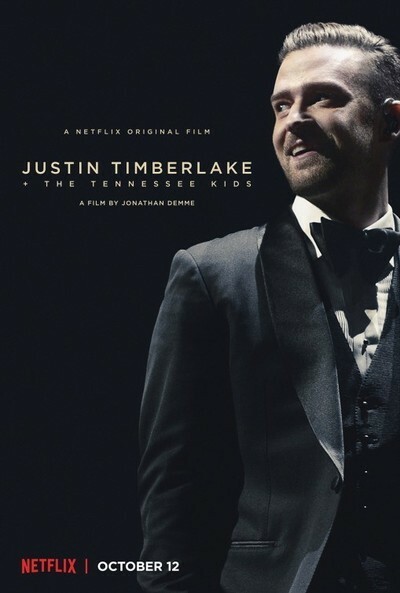 It's great that Netflix will allow more people to see “Justin Timberlake and the Tennessee Kids” than would be able to if it got the standard, major-city arthouse release that greets most concert films, but it was clearly designed for the large-format theatrical experience. Don’t watch it on your phone. Watch it on the biggest screen in your house. And turn it up loud. For 80 or so minutes, Demme and cinematographer Declan Quinn, who has been working with Demme for decades and shot two of the director’s Neil Young concert films, move fluidly with Timberlake utilizing camerawork that's deceptively brilliant. Notice how often they keep enough distance to let us take in the entire stage show, especially during extended dance numbers. Notice how Demme avoids the instinct to cut rapidly that we see so often in modern concert films, understanding that fluid long shots work much better than to cut back and forth across the stage. Demme’s efforts are in perfect rhythm with his subject, even down to how seamlessly he edits the show itself, excising several numbers that I hope someday make it to a Blu-ray special features section (I’m crestfallen that they dropped “Cry Me a River,” for example). Clearly, I’m a fan of Justin Timberlake, and I can’t divorce myself of that fandom to answer whether or not this would completely work for those who aren’t. But I really do think there’s enough here for anyone to appreciate, even those who can’t stand pop music. Appreciate “Justin Timberlake and the Tennessee Kids” as a chronicle of a man giving his absolute all to entertain those who pay to see him. And appreciate it as a piece of stellar filmmaking, a class in how to shoot a concert film in a way that doesn’t just chronicle what happened on that chilly Las Vegas night but that matches its subject’s personality. Demme’s concert films aren’t just recordings of events—they’re cinematic embodiments of their musicians, capturing in a moment an energy that transcends time.